Figure A28. Chukchi anomaly, interpreted as the Chukchi slab, with (horizontal) [vertical] cross sections through (A)[D] the UUP07 p-wave) and (B)[D] the combined SL2013 and S40RTS s-wave models at 1610 km; C) the location of the modern geological record that we interpret to have formed during the subduction of the slab. 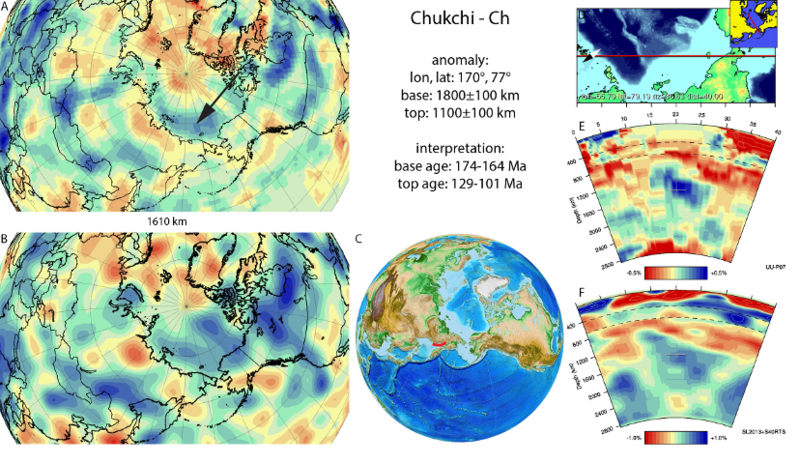 The W-E trending Chukchi anomaly (Figure A28) is located below North Siberia and the Chukchi Sea (Arctic Ocean) within the mid-mantle. At its base, at equivalent latitudes it is ocated in between the top of the Mongol-Kazakh slab towards the west and the Hudson slab towards the east. It was first identified in van der Meer et al. (2010), who interpreted it as the Chukchi slab representing paleo-Arctic lithosphere, subducted below the Upper Jurassic to Lower Cretaceous Koyukuk arc in a (near-) continental margin position. However, in the subsequent interpretation van der Meer et al (2012), we considered it more likely that the Chukchi slab resulted from northward Panthalassa Ocean subduction. This subduction may correlate with the Kony-Murgal arc Nokleberg et al. (2000), in which the age of was poorly constrained between Triassic and Early Cretaceous. Sokolov (2010) pointed out that the Middle Jurassic of the Kony-Murgal arc is characterized by structural rearrangements and deformation coinciding in time with the onset of the formation of the system of Pacific plates controlling the present-day appearance of the Pacific Ocean. This results in the start of the Late Jurassic–Early Cretaceous Uda–Murgal arc in the region of the Chukchi slab. Noteworthy is that the slab at its eastern extent has a N-S trend both in the UUP07 and S40RTS model, suggesting a change in subduction zone orientation. This change would fit with the eastward extent of the Uda-Murgal arc into the Pekulney and Oloy arcs during the Late Jurassic -EarlyCretaceous (Nokleberg et al., 2000) and subsequently modelled by Shephard et al. (2013) between 160-108 Ma. According to Sokolov et al. (2009), the accretionary prism (Beregovoi terrane) started forming in the Middle Jurassic, and the volcanic arc (central Taigonos terrane) ended in the Barremian-Albian. We therefore adopt a 174.1-163.5 Ma for the start of subduction and an end of 129.4-100.5 Ma for the end of subduction.